By the turn of the century the traditional dominance of the Imperial Navy over the oceans was in question, with the Prussian and Vulgarian Dreadnought fleets closing the technological gap. The Victory was the Admiralty's response. At the time of her launch she was the largest and most expensive vessel afloat, costing the then-vast sum of one and a half million pounds. Armed with six long-range guns designed to fire the new nitroglycerine shells, she was capable of a devastating strike against both naval and shore targets. For close-range defence she was also equipped with carbines and anti-aircraft weapons. She was also home to a midget submarine and a squad of the famous Navy Seal-Divers. These brave men, equipped with their distinctive diving apparatus made from the skins of rare seal pups, were to become world-famous for their exploits - in particular the daring wartime raid on the Prussian submersible yards of Kiel. 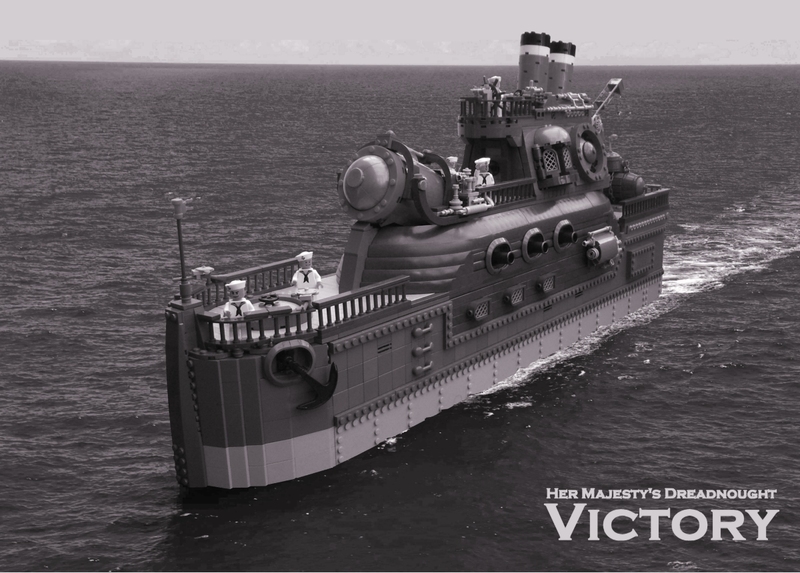 Interested readers can see a rare colour photograph of the Victory and a collection of technical blueprints here.